Welcome to Africa! Hotel rooms are available for mid-afternoon check-in. Start your PRIVATE SIGHTSEEING with a visit to the SHELDRICK ELEPHANT ORPHANAGE, founded and managed by Daphne Sheldrick. Here, you will learn about elephant conservation and meet elephant calves, orphaned by poachers, before they are re-introduced to the wild. Next, visit the KAREN BLIXEN MUSEUM, dedicated to the author of Out of Africa. Lastly, stop at the GIRAFFE CENTER, a non-profit organization focused on saving the Rothschild’s giraffe, where you will learn about this sub-species and have the opportunity to feed them. Today, drive to MAASAI MARA NATIONAL RESERVE, Kenya’s most famous game area. Stop for lunch en route before embarking on your first GAME DRIVE in search of the “Big 5”—lion, leopard, elephant, rhino, and Cape buffalo. Your Driver/Guide navigates you on MORNING & AFTERNOON GAME DRIVES in the “Mara,” as it is called by the locals. Part of the Serengeti ecosystem, the reserve boasts a strong permanent population of game. When the Great Migration of wildebeest and zebra arrives, generally between August and early November, the population enlarges by almost 2 million. This provides a great food source for predators such as lion, cheetah, leopard, and hyena. Further explore this magical place during MORNING & AFTERNOON GAME DRIVES. Watch for elephant, rhino, topi, cheetah, and more. Between drives, enjoy leisure time to relax. Join your Driver/Guide for one last GAME DRIVE this morning. Later, board a plane for the quick flight back to Nairobi where you will overnight. This morning, fly to Zimbabwe. This evening, enjoy a CRUISE on the Zambezi River, which affords you a great opportunity to photograph wildlife and a spectacular Africa sunset. Today, visit mighty VICTORIA FALLS for an awe-inspiring experience. Enjoy a PRIVATE GUIDED WALK, where you will learn the history of the falls and hear fascinating details about the surrounding flora and fauna. The remainder of the day is at your leisure. 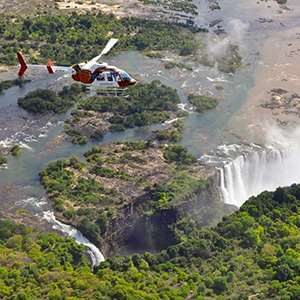 During the dry season (September-December) and during dry years, water flow to Victoria Falls may be low. Today, a PRIVATE TRANSFER brings you to CHOBE NATIONAL PARK, featuring some of the greatest concentrations of wildlife in Africa. Enjoy an AFTERNOON GAME ACTIVITY before dinner. Game activities in Chobe vary by lodge, but mainly consist of game drives/boat excursions. See accommodation descriptions for specific details. Explore this stunning land on MORNING & AFTERNOON GAME ACTIVITIES. You may see giraffe, lion, lechwe, and huge herds of elephant. It is said that these are the largest elephants in the world. Spend the middle of the day at your leisure. 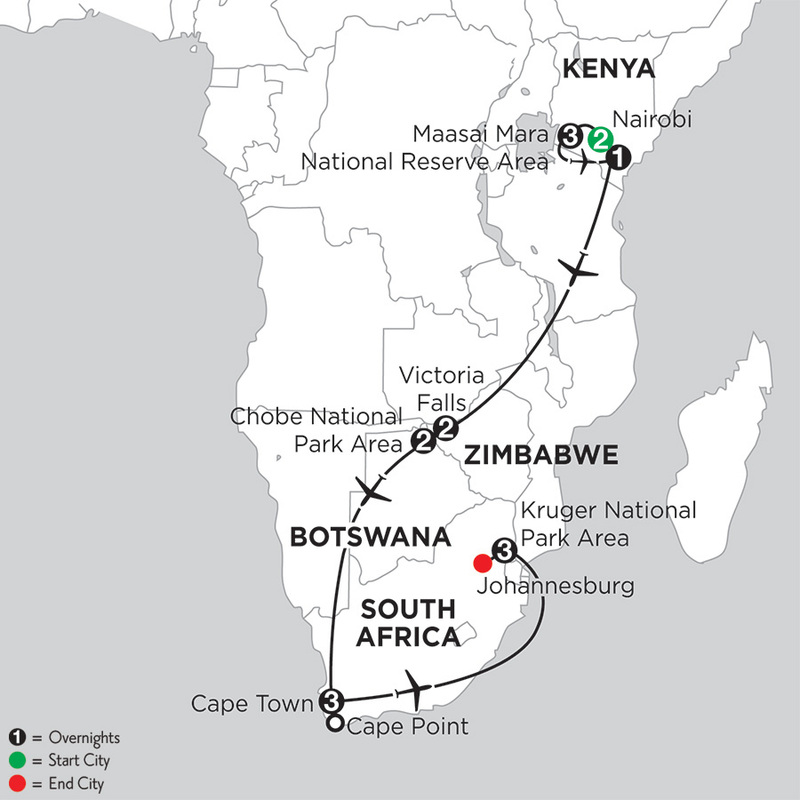 Today, fly to beautiful Cape Town (via Johannesburg), widely referred to as the “Mother City” by locals. Start your PRIVATE GUIDED TOUR with a CABLE-CAR RIDE up Table Mountain (weather permitting). Here, you will enjoy stunning views of the city and its surroundings. Next, stop at Boulders Beach, where you will visit a COLONY OF ENDANGERED AFRICAN PENGUINS, known for the unique sound they make. After lunch, continue to CAPE POINT NATURE RESERVE. Stop at the Cape of Good Hope and Cape Point, the southwesternmost point of the African continent, for incredible panoramic views. On your return journey, skirt the rocky coastline as you ascend Chapman’s Peak Drive, one of the most spectacular drives in the world, then continue through the fishing village of Hout Bay. The evening is at your leisure in Cape Town. Enjoy a full day at your leisure. Your Local Host is happy to make recommendations. Today, fly to the KRUGER NATIONAL PARK AREA and transfer to your lodge in a private game reserve. The Kruger area is famous for its abundance of wildlife, so you have a great chance to see the “Big 5”—lion, leopard, elephant, rhino, and buffalo. Other animals you may see include kudu, impala, giraffe, hippo, cheetah, spotted hyena, wildebeest, and more! This afternoon, embark on your first GAME DRIVE and stop for SUNDOWNER DRINKS as the sun sets over the bushveld. Game drives are shared with other lodge guests. Enjoy two full days of game viewing in this wondrous land. Wake up early for a MORNING GAME DRIVE in an open-air, 4-wheel-drive Land Rover. Your skilled tracker and professional Ranger will help you learn more about this special ecosystem as you view wildlife up close. After breakfast at your lodge, take advantage of some free time. Swim in the pool, read a book, or enjoy a drink at the bar. Tea will be served prior to your AFTERNOON GAME DRIVE. As the sun sets, stop for SUNDOWNER DRINKS in the bush! Return to your lodge in time to freshen up before dinner. Enjoy one last GAME DRIVE this morning before flying to Johannesburg to connect to your homebound flight. Book homebound flights after 5:30 pm. Kenya: private sightseeing vehicle in Nairobi & private safari mini-bus on safari carrying up to six people, and features a pop-up roof for easy game viewing/photography; Victoria Falls & Cape Town: private vehicle; Chobe Area: shared 4-wheel-drive safari vehicle and boat (varies by lodge/camp); Kruger Area: shared 4-wheel drive safari vehicle; private road transfer from Victoria Falls to Chobe; private (Kenya, Victoria Falls & Cape Town) or shared (Chobe Area & Kruger Area) transfers to/from airport for all intra-vacation flights; intra-vacation flights and taxes not included. Ideally located along Mombasa Road, this stylish hotel offers complimentary Wi-Fi hot spots, two restaurants, two bars, laundry and concierge services, a gym, and an outdoor swimming pool set in lush gardens. Eka Hotel is ideally located along Mombasa Road, just minutes away from Jomo Kenyatta International Airport, the Karen Blixen Museum, David Sheldrick Wildlife Trust, and the bustling central business district. Warm, welcoming guestrooms feature complimentary Wi-Fi hot spots, minibar, in-room safe, coffee-making facilities, flatscreen TV, and more. Set in expansive wooded gardens, the lodge has an ethnic design that incorporates traditional round buildings with thatched roofs and cottage-style guestrooms featuring verandas and ensuite bathrooms. On the slopes of the Oloongams Hills in the legendary Maasai Mara game reserve. The rooms with parquet floors and wooden paneled ceilings have 2 double beds with a mosquito net around them, ornamental fire place, ensuite bathroom with a shower, chairs and a coffee table and dressing table. Each has a verandah with two safari chairs. The Kingdom at Victoria falls is situated within the Victoria Falls National Park where game, ranging from Warthog to Elephant roam freely. Its distinctive architectural design is based on the great Zimbabwe monument. A unique water feature in the form of a man made lake gives inward facing rooms the impression of having been built on the edge of the lake. Located within Victoria Falls National Park only a short walk from the falls. Rooms feature balconies with garden or water views. The 294 air-conditioned guestrooms at The Kingdom At Victoria Falls include balconies with garden or water views. Featuring classic bush ambiance, Chobe Bush Lodge is a haven of beautiful design and desirable amenities near the banks of Botswana's Chobe River. Adjacent to Chobe National Park, Chobe Bush Lodge is situated where Botswana, Namibia, Zimbabwe, and Zambia meet, and is just a 5-minute drive from the park entrance. Chobe Bush Lodge's modern, spacious guestrooms feature air-conditioning, private bathroom with bath and shower, TV, tea/coffee station, in-room safe, outdoor patio, and more. With modern amenities, warm hospitality, a perfect location, StayEasy Cape Town City Bowl is an easy choice when deciding on where to stay in Cape Town. Located on the vibrant corner of Bree and Strand Street, visitors can take advantage of the hotel¿s proximity to popular city neighborhoods and cultural sites. Perfectly located in the heart of the city close to shops, restaurants, and attractions. StayEasy Cape Town City Bowl has 302 fresh and stylish rooms. All rooms are equipped with in-room controlled air conditioning, free Wi-Fi (daily limit), a work desk, and large in-room safe. Fringing the Karongwe Game Reserve, Shiduli Private Game Lodge embodies grace and elegance, yet exudes unsurpassed warmth and hospitality. Guests can step into the relaxed ambience of the lodge with its lush indigenous garden dappled in shade, lounges with Internet facilities, bar, huge sparkling pool, and thatched dining areas punctuated with original South African art. In Karongwe Private Game Reserve, just a short distance from Kruger National Park. Surrounded by beautiful and lush indigenous garden, the 24 intimate air conditioned ensuite rooms at Shiduli feature rich, earthly tones, and aromatic timber. The beds fitted with crisp white linen are swathed in flowing mosquito nets under the canopy of a thatch roof. The rich African toned bathrooms have glass enclosed revitalizing showers with dual wash basins. Despite its central location, the Nairobi Serena hotel is a quiet sanctuary amid the bustle of one of Africa's most dynamic cities. The interior décor reflects an entirely pan-African theme featuring art and inspiration from Ethiopia, the Maghreb, West Africa and East Africa. Offering a wide range of dining experiences, The Nairobi Serena is renowned for its 'Mandhari' fine-dining restaurant, which is universally acknowledged as one of Kenya's finest. Located in central Nairobi, just moments from most of the cities attractions including art & cultural institutions, shopping, nightlife and entertainment. The 183 guestrooms are presented in a fusion of international and pan-African design. All rooms include internet access, safes, minibars, LCD TVs with satellite, complimentary bottled water, coffee and tea. Sarova Mara Camp is situated in the Maasai Mara Game Reserve, offering a front seat to the rolling plains of East Africa. The camp offers an unparalleled plethora of activities and experiences from tented living to bird-watching to a unique insight into the Maasai culture at the adjoining Maasai village. The large grounds are beautifully laid out with exotic trees and indigenous shrubs. Located on a hill surrounded by two streams in the famed Maasai Mara National Reserve. Tents are large and comfortable, tastefully furnished with double and twin beds, wardrobes, writing desk and safari chairs. Relax outside your own tent listening to the Orchestra of rasping Cicadas, croaking Tree Frogs and the intermittent call of birds and monkeys is a memorable symphony. Sand River in the Maasai Mara replicates the heyday of exclusive permanent tented camps of the late 1920's. The carefully crafted interior designs mirror this period perfectly and are reminiscent of countless Hollywood movies that paid homage to the classic era of African adventure. The camp features just 16 tented accommodations, a sparkling pool, comfortable lounge, library, and wine cellar. Service standards are exceptional and the location was carefully chosen for optimal an optimal game viewing experience. Electricity is provided 24 hours a day. The camp is located on the banks of the Sand River in a secluded and picturesque area of the Maasai Mara National Reserve close to the Tanzania border. Each of the 16 luxury tents are built on raised platforms with a private verandah overlooking the Sand River. Inside the elegant tents include four-poster beds, sitting area, writing desk, fan, and opulent soft furnishings. Ensuite bathrooms feature a large soaking tub, dual sink vanity, and refreshing outdoor shower. Sanctuary Olonana is an award-winning camp with just 14 tents. It is located on a private stretch of the Mara River, at the foot of the impressive Siria Escarpment close to where the famous last scene from ""Out of Africa"" was filmed. The game concentration is high - and during the annual wildebeest migration from around July to October, the action happens right on the camp's doorstep! The main dining room and veranda command views over a dramatic stretch of the Mara River. See, and hear, the family of noisy hippos who colonies the banks below the camp. The camp also features a library, a pool, a mini-spa where guests can experience traditional African remedies alongside French marine therapies. Electricity is provided 24 hours a day. On a private stretch of the Mara River at the foot of the Siria Escarpment in the Maasai Mara National Reserve. The 14 canvas tents are extremely comfortable and spacious with parquet floors, four-poster beds, and ensuite bathrooms. They also feature a private verandah overlooking the Mara River, the perfect spot to relax and watch the resident hippos. Ilala Lodge provides distinguished accommodation in a gracious and secluded ambiance. The hotel is the closest to Victoria Falls as well as the town center. Wild animals often graze on the hotel lawns with the spray of the falls in the background. Bordering Victoria Falls National Park, the lodge is the closest to mighty Victoria Falls. Ilala Lodge offers 32 standard rooms and 2 deluxe suites. All rooms have en suite bathroom with separate shower, air conditioning, overhead fan, satellite TV and have individual coffee and tea facilities. The rooms are spacious with railway sleeper teak furnishings and patio doors leading onto either open lawn or a balcony where you are afforded a view of the spray of the falls from the upper level rooms. Stand 471 Squire Cummings Ave.
Overlooking Zambezi National Park, Victoria Falls Safari Club is in a rural location where African history and nature bring an atmosphere of exclusive African uniqueness. The hotel features private check-in, butler service, a restaurant, bar, outdoor pool, complimentary cocktail hour and 24 hour room service. Located just 4km from Victoria Falls, the hotel overlooks Zambezi National Park. The 20 luxury rooms include private balcony with views, large bathroom with separate bathtub and shower, beds facing the window, air-conditioning, complimentary Wi-Fi access, coffee/tea maker, espresso machine, in-room safe, and hairdryer in the bathroom. Picturesquely situated overlooking the Chobe River and the Caprivi floodplains, the iconic Chobe Game Lodge is the only permanent safari lodge within the Chobe National Park. All safari activities are tailored to suit individual requirements. 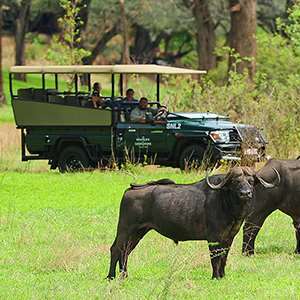 Game drives, game viewing by small boats with a maximum capacity of twelve guests, sunset cruises along the Chobe River and after-dinner stargazing are offered. Electricity is provided 24 hours a day. Situated on the banks of the Chobe River in the northeast corner of Chobe National Park. The lodge accommodates up to 94 guests in absolute luxury. Rooms are river-facing, and include minibars, ensuite bathrooms, tea and coffee making facilities as well as private terraces. With just 12 suites Ngoma Safari Lodge offers and intimate safari experience. The buildings are all made from natural materials and blend seamlessly with their surroundings. Ethnic fabrics, building material, and artifacts provide a local touch. The lodge is also positioned to feature panoramic views over the legendary Chobe River with many opportunities to see elephants, zebra, and buffalo grazing on the floodplain. The central area of the lodge houses the reception area, lounge, dining room, bar, and a plunge pool. A well-positioned viewing deck gives guests a perfect setting from which to enjoy a beautifully prepared evening meal with views over a floodlit waterhole frequented by elephants and other game. Electricity is provided 24 hours a day. Overlooking the Chobe River on the western side of Chobe National Park. The 12 spacious suites offer views of the remarkable Chobe River and all it's inhabitants. A private terrace with chairs and a plunge pool is a great place to take in the views and relax at the end of the day. Inside the suites have a sitting area, large windows, air conditioning, a ceiling fan, and minibar. Ensuite bathrooms feature a bathtub and indoor and outdoor showers. Southern Sun The Cullinan offers travelers easy access to all that Cape Town has to offer including the popular Victoria & Alfred Waterfront. Complementing the rich, cultural heritage of Cape Town through timeless architecture, the opulent décor creates a mood that is a world away from home, while service and attention to detail ensure your every need is taken care of. Ideally located within a short distance to the world-renowned V&A Waterfront and the Cape Town CBD. The 394 stately guestrooms are elegantly decorated with rich finishes and furnishings, luxurious bathrooms, and all the in room amenities to ensure your stay is as comfortable as possible. Located in the heart of the Victoria & Alfred Waterfront, the hub of one of the world's most picturesque working harbors and close to the arrival point for cruise liners, this breathtaking hotel combines the elegance of the stunning neo-Victorian architecture with traditional hospitality. The rooms command magnificent views over the bay to famous Robben Island, and inwards to the city and the iconic outline of Table Mountain. The hotel is located in the heart of the Victoria & Alfred Waterfront with its shopping, restaurants, and bars. The Table Bay Hotel is synonymous with luxurious style and opulence, and the Twin Rooms reflect this beauty in their décor and furnishings. Each of these rooms contains 2 twin beds alongside each other and an ensuite bathroom with marble topped vanity and a large walk in shower. The rooms are spacious with walk in cupboards, armoires and writing desks. Guests also have access to the latest telephonic and broadband technology; color satellite remote controlled TV and radio. There is also a butler station, honor bar, computerized safe, hairdryers, self-controlled air-conditioning and heating, universal adaptor socket (Voltage 220V) as well as 24-hour in room dining. Makalali Main Lodge is a newly built lodge located in Makalali Private Game Reserve. Enjoy the luxury of air-conditioned rooms with comfortable interiors of classic leather and wood furnishings. The central area is designed with rustic features that effortlessly bring outside elements indoors. The outside area is distinctively designed around the natural surrounds, with a spacious deck area built around indigenous trees that overlook a watering hole. This is the ideal spot to view wildlife and appreciate the scenery. The large crystal blue rim-flow pool is equally spectacular! Its comfortable chairs and sun-loungers create an inviting ambience. Enjoy an array of African cuisine in main dining area with its distinct fireplace that connects the bar lounge and dining area. Furthermore, the spa offers a variety of therapeutic treatments and the library offers a quiet space to relax with a book. Located in the heart of Makalali Private Game Reserve, west of Kruger National Park near the Drakensberg mountain range. The 30 rooms are decorated with classic furnishings and feature a comfortable bed looking out to a large private viewing deck with table and chairs. Other amenities include air-conditioning, bathroom with indoor and outdoor showers, large closet, and ceiling fan. Set on the Klaserie River in Kapama Private Game Reserve, Kapama Karula offers true luxury in the bush with just 12 suites. Karula means ""place of peace"" in the native tongue and upon arrival you will see why. The contemporary yet African feel to the camp will satisfy and exceed the expectations of even the most discerning connoisseurs. With floor-to-ceiling glass doors and skylights the cozy open plan lounge and bar area is a day time favorite to enjoy a drink or just sit back and enjoy the sights Karula has to offer. The outside wooden deck overlooking the Klaserie river gives you the opportunity to enjoy the tranquil atmosphere and magnificent vistas the camp has to offer while the welcoming pool offers a great way to relax during the heat of the day. Electricity is provided 24 hours a day. Situated in Kapama Private Game Reserve, part of the greater Kruger National Park. Each of the superior suites offers over 1,400 square feet of living space with private plunge pool, inside and outside showers, his and hers sinks, bath, Wi-Fi Internet access, and much more. The massive glass sliding doors and huge private deck offer breathtaking views. Kapama Southern Camp, with 25 suites, is situated in the southern most part of Kapama Private Game Reserve. Guests are treated like royalty by the friendly staff and are encouraged to take a break from the African sun in the stunning swimming pool, or to relax in the lounge with a stylish cocktail. As you relax you may even some of the many animals that pass close to the lodge on a frequent basis. The camp serves breakfast and lunch in an open air setting and dinner under the stars in a traditional Boma. Electricity is provided 24 hours a day. The suites are comfortably decorated and spare no expense. They have air conditioning, large bathtubs with stunning views out the windows, the finest linens, and a private deck to enjoy stunning views. 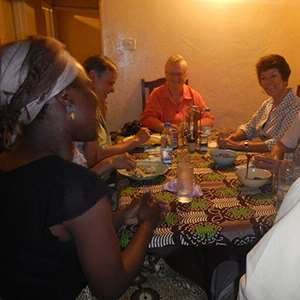 Join a local family for dinner and fascinating conversation all while learning about the local culture and traditions. Visit the historic Bo-Kaap, or Cape Malay area, where you will learn about the culture and visit a local home for a cooking class. 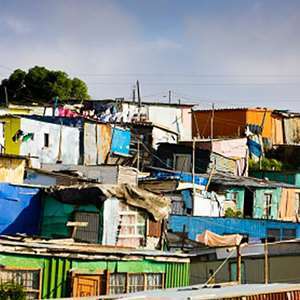 Embark on a thought-provoking journey into South Africa's Apartheid past with an expert private guide. 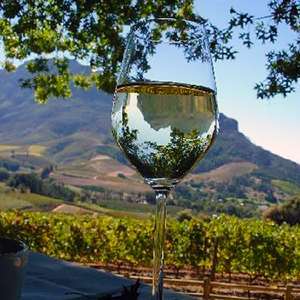 Monograms provides travelers access to a Local Host®, so you will have someone on hand to answer those vacation questions pertaining to Cape Town, South Africa. No waiting in line at the concierge desk or trying to ask your waitress at breakfast directions to the shopping district. Simply ask your Local Host® about Cape Town and you'll be on your way in no time. Plus, your Local Host® will share local Cape Town and South Africa insights and share suggestions for getting off the beaten path, leaving you more time to create lasting vacation memories that are yours alone. Robert has been involved in tourism for almost 30 years. He began his career as a driver and when that was not enough to fill his desire for tourism, he began his studies to become a tour guide. With numerous years of experience in travel and tourism, Robert continues to delight everyone he meets by sharing his passion for travel. He is eager to share his extensive knowledge of South Africa to give travellers an experience of a lifetime! Set against the eastern slopes of Table Mountain in Cape Town, Kirstenbosch is rated as one of the most magnificent botanical gardens in the world. It is actually part of a larger nature reserve that is dedicated to preserving the diverse flora of this region and other parts of South Africa. It is part of the Cape Floral Kingdom which was declared a UNESCO World Heritage Site in 2004. This is a must visit while in Cape Town if you love plants or learning about unique habitats. Also known as the "Cape Malay Quarter" this lively Cape Town neighborhood is famous for its colorful houses, ranging from lime-green and pink to orange. Founded by former slaves in the 1750s, it has a fascinating history and is a true melting pot of cultures. 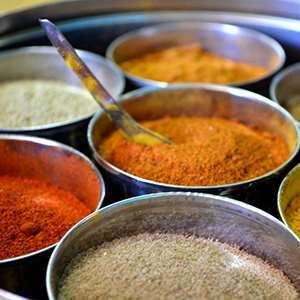 Walk through the neighborhood and absorb the atmosphere and consider stopping for a traditional Malay meal at a local restaurant or visit the Bo-Kaap Museum to learn more about the history of the neighborhood and the people that call it home. This moving and informative museum documents the history of this vibrant area that was bulldozed during the Apartheid years. Through the use of photographs and testimonials the moving story of the 60,000 people who were forcibly displaced comes to life. For history buffs this is the one museum in Cape Town that is not to be missed. Did someone say diamonds? South Africa has storied history of diamond mining that is chronicled at this museum. Diamonds were discovered in South Africa in 1867 and within ten years 95% of the worldwide supply was coming from this rugged country at the southern tip of Africa. From the birth of a stone to the final polishing to colorful characters the story of diamonds in South Africa is a fascinating one. Add to that the convenient location in the heart of the Victoria & Alfred Waterfront and it is easy to add this to your visit.